A got an email from a Facebook friend in the UK the other night. Evidently someone had gifted her and her partner with a pound of minced meat and she wanted to know if I knew what she could do with it....wait for it. Sure, I dashed back...why don't you do Kheemah? The Indian version of the burger..or the meatball, or the patty melt..using the ever popular, chamelion like ground meat. I've made this dish for all sorts of picnic type events. In fact this last 4th of July I served it with chapatis wrapped around it, and assorted Indian relishes and sambols. I also served hot dogs for those that didn't want to get too wild. It can be made with whatever ground meat products one might have on hand. Turkey works, as does, chicken, beef I imagine even seitan, tofu or quorn if one is a vegetarian. Today I'm making it with lamb. This is pretty simple, just like making a meatloaf..but not. I'm also betting you have everything already in your fridge and pantry for this one, so follow along. 1/4 cup finely chopped fresh mint. Finally toss in 1/2 cup finely chopped cilantro and 1/4 finely chopped fresh mint. Mix all of this together ..almost like you're making meatloaf, mix till it's smooth. place in in a covered bowl in the fridge to set a bit. Make sure you take it out 1/2 hour before you're going to cook it. 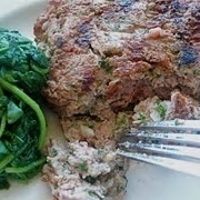 make patties of the meat and grill it...either in a pan or on the barbecue. Kheema are good stuffed in pita bread or on a bun, molded like meatballs on skewers or as I mentioned before in chapatis or naan bread now that I think of it. You might even put this in a loaf pan and bake it like a meatloaf. I haven't tried that yet, but it certainly makes sense.... more sense than I did running around in leggings and big hair.I'd love to show you all those pictures of the 80's one day, but the dog ate them. Of course he had a little help. Anything tastes good wrapped around kheemah. I think I will make this tomorrow! Such a versitile recipe~wonderful flavors all together in one place! You know how much I love lamb and that I have a ton of it in the freezer. You can be sure that I will give this a try in the next few days! A Bollywood Hollywood Oscar Feast! Now With Jackfruit Curry!